Spring is thoroughly moving through Southern California. In our local environs, this isn’t so much rain and crisp temps warming as the day goes on. It’s pretty much perfect temperatures every single day, and flowers everywhere. To appreciate it, you just have to pack away your jackets and gloves slip on some shorts and shoes and go out and enjoy the scent of lavenders, poppies, and daffodils in bloom. 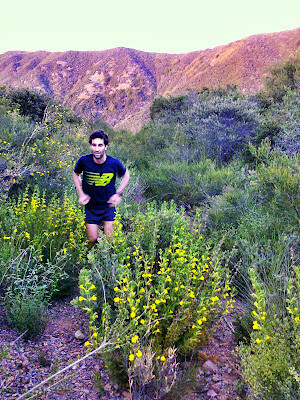 The arid summer will eventually arrive, but for now, every run is a reward for getting on the trail. Though I love to compete in the summer, I love to train in the spring. In addition to natural inspiration, there’s also a ton of peer inspiration from Transvulcania. I think when I got into ultrarunning four years ago, it was special enough to be a good climber and to glide through the downhills. Now, in light of the way the way the race played out, there’s even more time to be squeezed out of a well executed, fast, efficient downhill. Dakota definitely exhibited some skills honed from his Grand Canyon runs, and showed the value of controlled speed and a little more cushion on a 7,000ft descent. This isn’t to say that a solid uphill isn’t key, but more that the talent pool is coalescing around a certain climbing speed/efficiency, but there is some variation in downhill ability/capacity. This is definitely something to consider for the mountain 100’s this summer. April 30-May6: 41 miles, 8250 ft.
Not very strong, and a bit below where I wanted to be, but ready to move into the high country work with the first tough weekend out of the way..